Customers get the storage and backup their growing organization needs, with easy collaboration for the entire company. Give customers the ability to oversee company data with enterprise-grade administrative control and visibility tools. Effortlessly create, share, and keep teams on the same page — with the added benefit of admin controls to protect the team. Dropbox seamlessly integrates with best-of-breed apps customers already use and love like Adobe, Microsoft Office 365, and more. 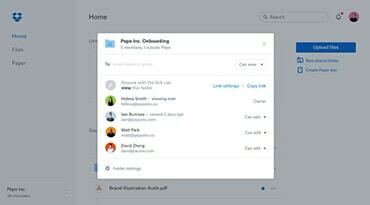 Dropbox also provides free online Partner Training. This sales readiness program teaches partners how to identify Dropbox Business sales opportunities, how to demo Dropbox Business, how Dropbox Business is different from other collaboration providers, and much more.